The Popcorn Turkey Hands Recipe is brought to you by Just Plum Crazy! 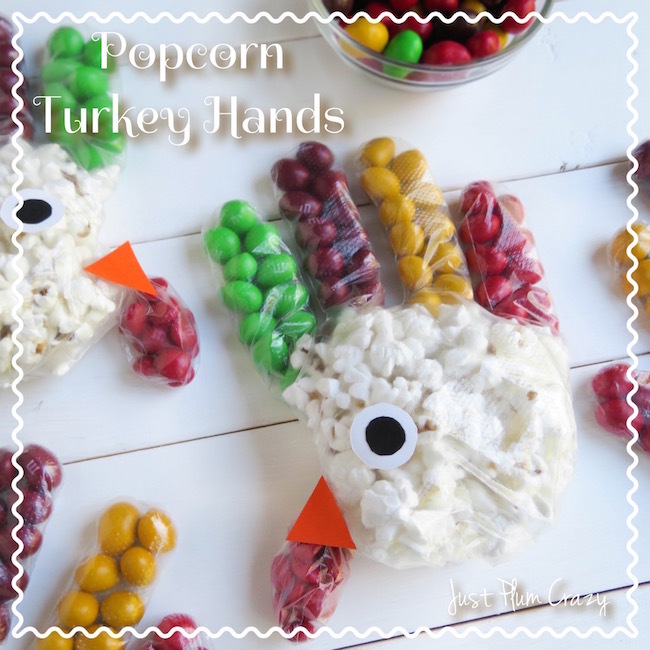 Here we have another cute recipe…Popcorn Turkey Hands recipe. 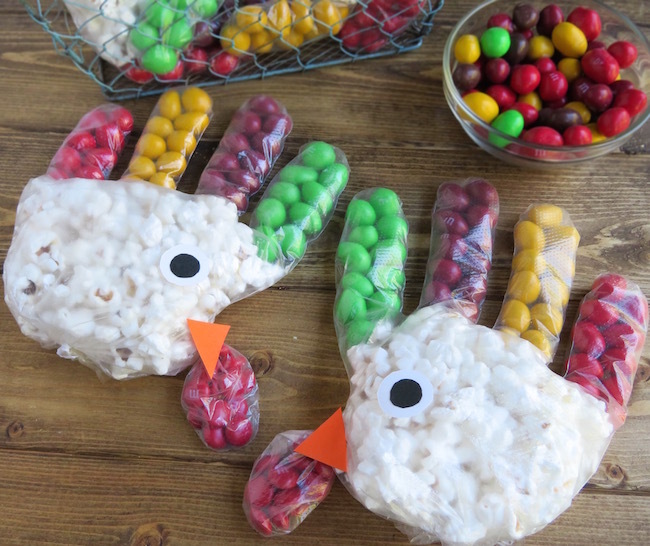 The kids can help you make these and are great for a school party or the kid’s Thanksgiving table. Peanut M&M’s Harvest Color & Regular Color (only need if you want green). 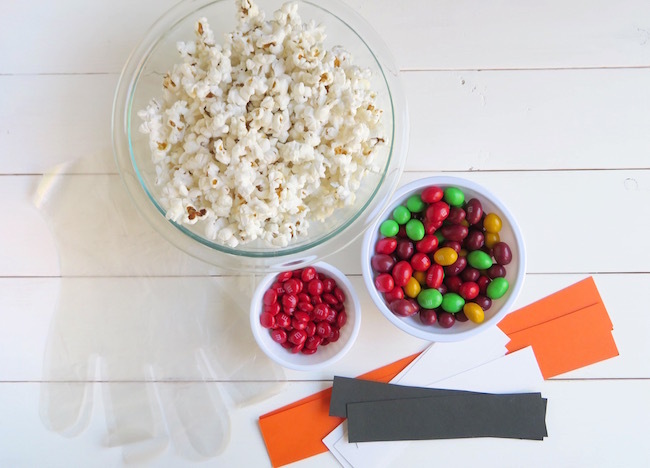 Plain M&M’s (just need red for the wattle). 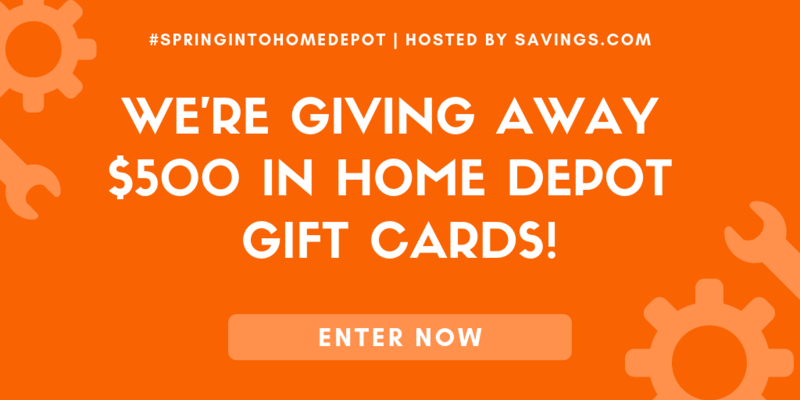 Orange, black, & white construction paper. 1. Pop the popcorn according to the package. Let cool. 2. 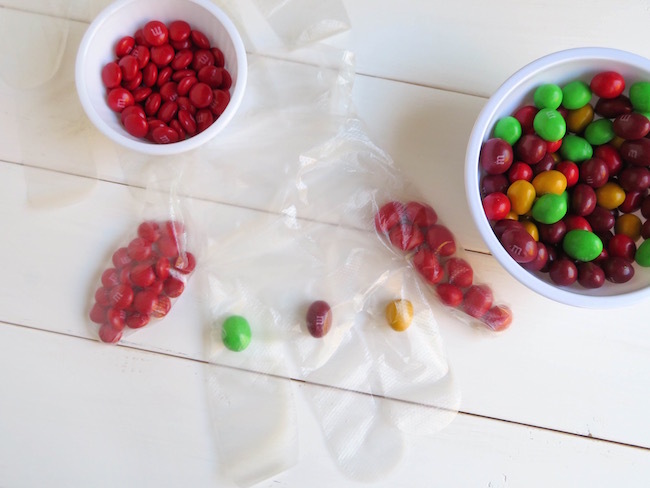 Take a disposable glove and feel each finger with a different color of peanut M&M. 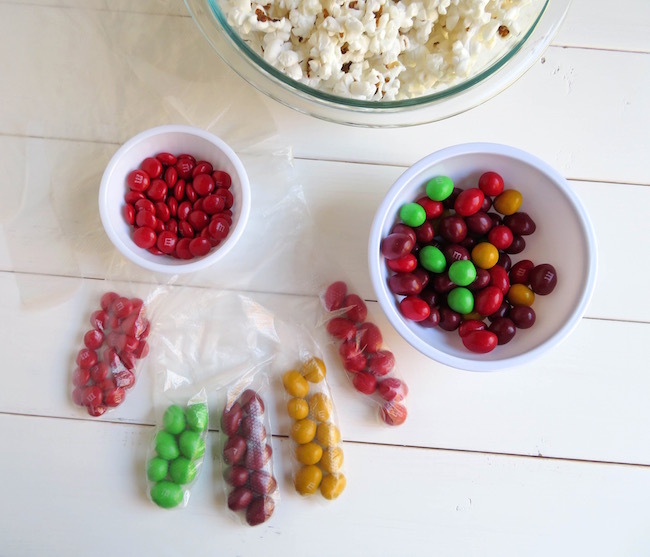 Then fill thumb about ½ way with red plain M&Ms. 3. Fill the rest of glove with your cooled popped popcorn. 4. Close with a twist tie. 5. 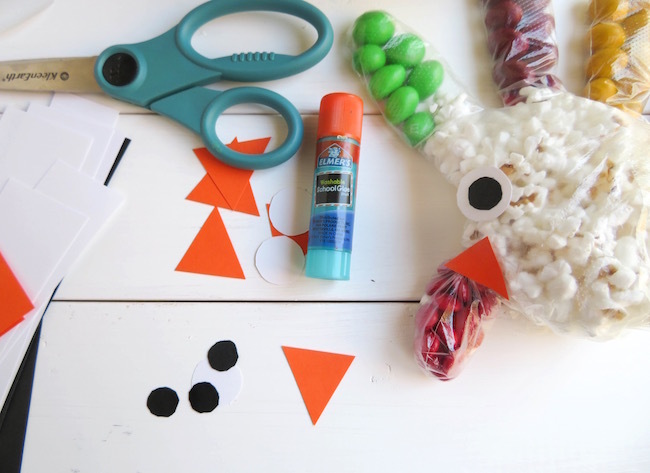 Take your orange construction paper and cut out a triangle for the beak. Then cut out a white circle for the eye and a smaller black circle for the pupil. 6. Take your black circle and glue it on top of your white circle to create your eye. 7. Glue your eye on right above the wattle (thumb). 8. Twist the thumb and glue your beak where you twisted it. 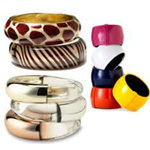 (You could also use a twist tie to tie the thumb). 9. Your all set, they’re all ready to Gobble! 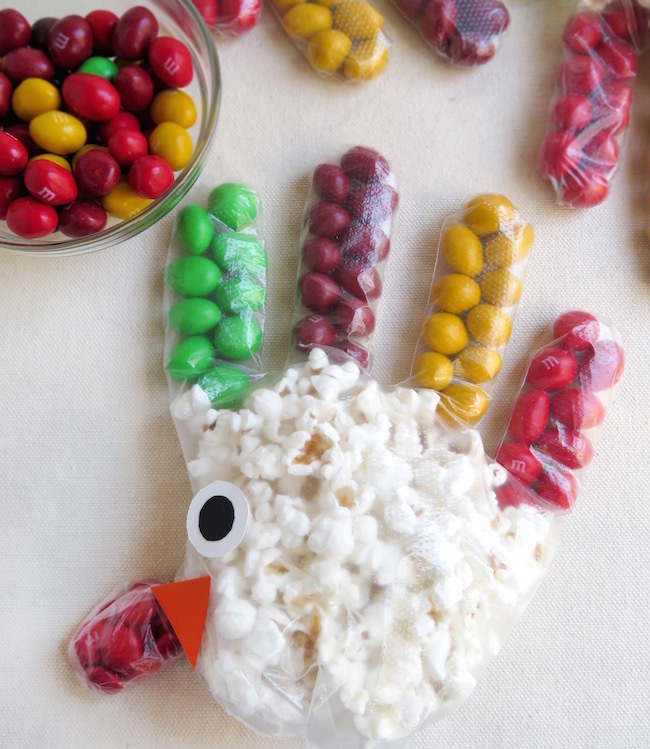 2 Bags of Microwave Popcorn and 1 bag of peanut & plain M&Ms makes about 6 turkey hands. 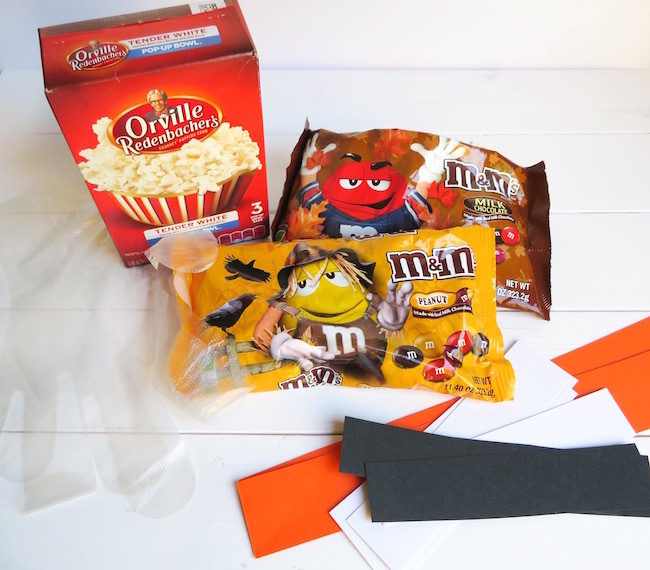 Take a disposable glove and feel each finger with a different color of peanut M&M. 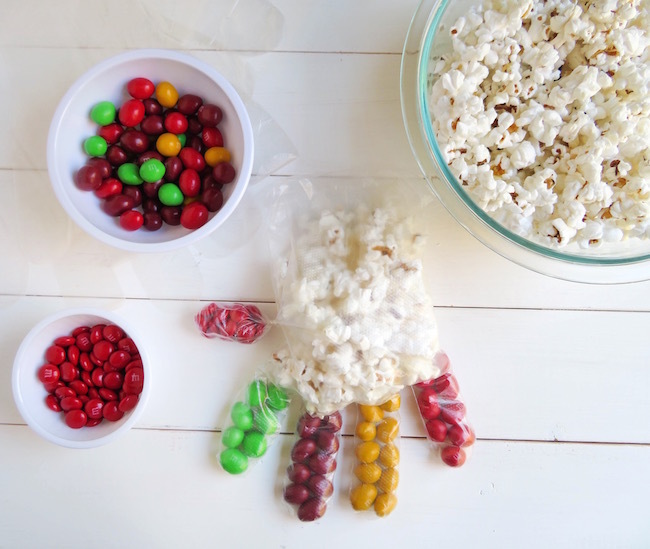 Then fill thumb about ½ way with red plain M&Ms. 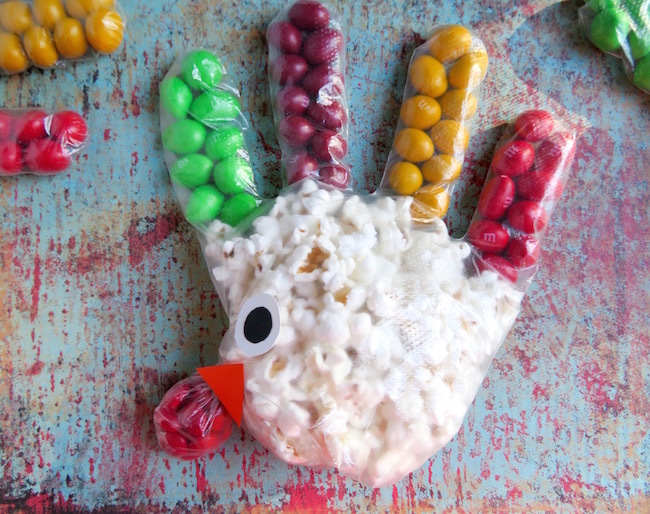 Fill the rest of glove with your cooled popped popcorn. Close with a twist tie. 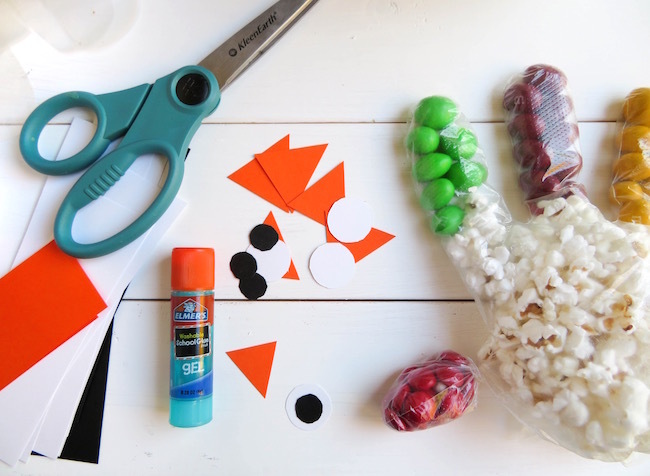 Take your orange construction paper and cut out a triangle for the beak. Then cut out a white circle for the eye and a smaller black circle for the pupil. Take your black circle and glue it on top of your white circle to create your eye. Glue your eye on right above the wattle (thumb). Twist the thumb and glue your beak where you twisted it. (You could also use a twist tie to tie the thumb). Your all set, they’re all ready to Gobble!